In the Super Latemodel class, Brian donated $5 for the trophy dash winner. Brian won the trophy dash and captured the trophy dash championship. Adam won the A Main, barely holding off Brian on the last lap. Adam received a bottle of wine donated by Durso Hills Winery. 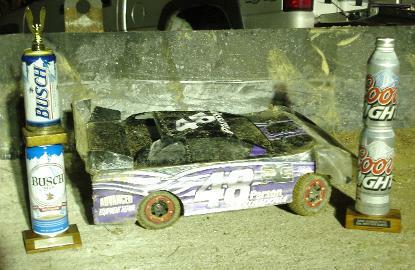 In the Crate Latemodel class Eric donated $10 to the A Main winner. Adam won the A Main with 1/3 of a body. In the Super Latemodel class Brian donated $10 to the trophy dash winner and $20 to the A Main winner. Brian won the trophy dash and re-donated his winnings to the A Main. Eric won the A Main and most of the money. A pill was drawn to determine who won the extra $10. Whoever finished in the position won the money. After the race was over, the pill was revealed. Adam finished third and won the extra $10. Steve finished second and earned his highest finishing position of the year. Chris finished fourth to collect the last of the money. Harold won $30, a T-shirt sponsored by Greenville Saw & Hardware and a bottle of wine sponsored by Durso Hills Winery. Adam won $25, and a bottle of wine sponsored by Durso Hills Winery. Steve C. won a hat sponsored by Greenville Saw & Hardware for setting fast time in the Super Late Models. Chris won $10 for setting fast time in the Crate Late Models. Both fast times were new track records for each class. The Crate Late Model A Main event had several different leaders, but Adam was the leader when the checkered flag fell. The Super Late Model A Main was 50 laps. Brian sit on the front row pole and led every lap. He won the race without too much pressure from his competitors and earns a starting spot in the All Star Race. The track record was broken several times, but Brian set the fast time with a 7.20 second lap. He won $10 from Chris for the new track record. Wyatt led several laps but couldn't hang on for the full fifteen laps. Steve C. raced his Crate Late Model for the first time and won the A Main. Harold won the Super Late Model A Main. This was Harold's third feature win in a row. He also triple crowned, which is his second on the year. Brian donated ten dollars to anybody that could break the track record in the super class. Brian broke the record by .03 seconds and donated his $10 to the super class A Main winner. Harold won the Super Late Model A Main with a pass on Eric coming out of turn four on the last lap. Adam won the Crate Late Model A Main. They both won some extra cash donated by the 50/50 money and Eric's 50/50 winnings. Harold won $105, a Lunsford Racing t-shirt, and a huge check for the win. Chris won a Lunsford Racing t-shirt for the win. Eric won a Lunsford Racing t-shirt. Darian won $20 donated by Onstat Racing. Scott won an Onstat Bullet Late Model Body donated by Onstat Racing. Darian and Eric received Tekno RC driveshaft kits. Every driver received RPM parts trays. Eric won a $10 gift card to Durso Hills Winery in Marquand, donated by Jay Hansmann. Harold drove Adam's Crate car and won a $10 gift card to Wal-Mart, donated by Stroup RC Racing. Scott won a $15 gift card to LLB Signs and Hobbies in Poplar Bluff. Eric won a $10 gift card to LLB Signs and Hobbies in Poplar Bluff. 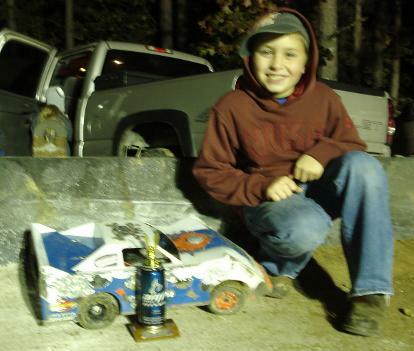 It was a great night for Adam S. who not only won the A Main event, but also picked up a Triple Crown. Adam also took home $35 for the A Main win with the thanks of Darian for his donation of concession money. On a green/white/checkered finish, Adam S. took the lead from Eric and held him off for the victory. Adam took home $19 for the win with the thanks of Darian for his donation of concession money. Adam won a Stihl t-shirt donated by Greenville Saw & Hardware in Greenville. Jim won a bottle of wine donated by Durso Hills Winery in Marquand.